Designed to make cooking a seamless experience, continuous cast-iron burners make it easy to move heavy cookware across the cooktop. Use six 18,000 BTU dual-flame stacked burners to prepare multiple dishes at once. You can even use reversible burner grates to accommodate a wok for Asian-inspired cuisines and after dinner, cleanup is a breeze with sealed cooktop burners. This 30-inch gas cooktop provides exceptional power with five individual burners, including a powerful 17K BTU Dual Ring Burner. For added versatility, the 6K BTU Even-Heat Simmer Burner creates ideal conditions to melt without scorching. The CookShield Finish protects the cooktop against stains that may occur due to high-temperature cooking and makes it easy to wipe clean without harsh chemicals. 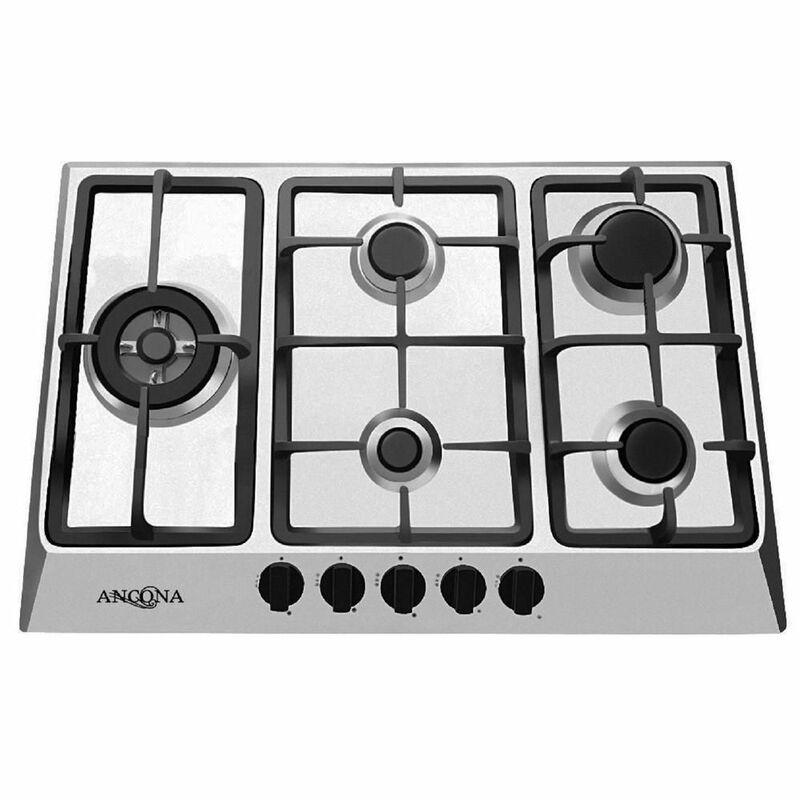 30 inch Gas Cooktop in Stainless Steel with 4 Burners including Triple Ring Brass Power Burner Get precise cooking results you can depend on with this Ancona Elite Gas Cooktop. Constructed with 430 grade stainless steel, it features heavy-duty cast-iron grates and electronic ignition with flame failure safety device. Everyday meals and holiday feasts will be a breeze with this gas cooktop. Consisting of sealed burners, it allows you the ease of boiling, frying or searing on high heat or simmering on low heat, without the worry of food spillage. The individual triple ring burner offers greater surface space and the flexibility to position large pots and pans. The cast-iron grates are easy to handle and remove for cleaning. The Ancona Elite Gas Cooktop offers style, function and performance, creating an optimal culinary experience. 30 inch Gas Cooktop in Stainless Steel with 4 Burners including Triple Ring Brass Power Burner is rated 4.1 out of 5 by 17. Rated 5 out of 5 by Chef du Masion from Good value appliance Has a great wok attachment that was not advertised. Does not have the griddle attachment that was pictured. The griddle is an extra charge. It takes a bit of getting used to the safety feature of flame sensor. My old unit assumed you would watch to see the flame was working. This one turns off the gas if there is no flame. It is useful if you have the window open and the possibility of the wind blowing out the simmering flame. Rated 5 out of 5 by Spicy curry from Workaholic range We cook every day twice a day. It is meant for long run and is durable. Rated 5 out of 5 by Neil from Well built, easy to clean and well priced. This is our second cooktop from Ancona. The first one is on its fifth year and we have no complaints. We replaced the round perforated outlets(?) on a couple of the burners and that’s been the only replacement we’ve had to do. We bought these cooktops through COSTCO’s website and they were easy to install when they arrived fairly quickly. Rated 5 out of 5 by Angie Baby from Works Great!! Bought it about 3 months ago so far it works really great and for the price it’s a steal. Pretty easy install too!! Rated 5 out of 5 by PVPK from A sleek design with great features I am absolutely satisfied with this product. It’s sleek design and positioning of the burners are ideal for cooking multiple dishes at the same time. I love that I could move pots around seemlessly from one burner to another. The most noteworthy feature is how effortless it is to clean up this stove. There aren’t any unnecessary nooks and cranny where food particles can get stuck into. Here’s the best part, installation was so easy that my husband was able to install it!!! Priceless!! !